As you open the front door of this historic clapboard house, you are greeted by wide pine plank floors, period furnishings and, of course, your host Ray Guy. Once inside, the large dining room, its mahogany table and sideboard create the perfect setting for the hearty breakfasts enjoyed by all. After the meal, relax in comfy Windsor chairs as you peruse the built-in china cabinets, proudly displaying their many treasures. Step through the french doors and onto the brick terrace, then down a few steps to a manicured lawn, offering both sunny and shaded areas, guest seating, and a herb garden. Once inside again, colourful cut flowers abound,including fresh roses in all guest rooms. 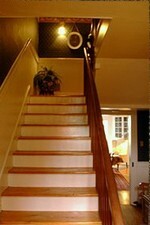 Up the stairs, tucked under the eaves, for your convenience is refrigerated bottled water and private telephone access. As the custodians of this historic house, Valerie and Ray have taken special care to ensure all guest rooms retain the warmth and charm of their historic past, together with the comforts and conveniences today's visitors expect and appreciate. 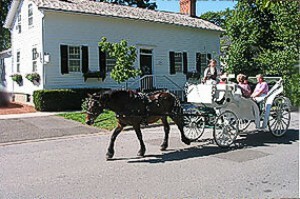 Please visit our web site at www.historicwilson-guyhouse.com to download full driving instructions from any direction. Call Ray for any special instructions at 905-468-5362. We provide a varied but full gourmet breakfast. It will consist of a baked good, a fresh fruit plate and a main course. There is always plenty of fresh coffee and tea served as well as filtered water. Description: This lovely second floor room, done in soft colours, has an operating fireplace and a cosy sitting area. Bathroom Description: Full three piece bathroom. Description: This large spacious room faces south and includes two wingback chairs. 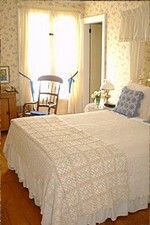 The king sized bed is convertable to a twin bedded room, with a cot available for an additional person in either configuration. There is an electric fireplace for winter use, and although central air, an extra window A/C is available for summer use. Bathroom Description: Three piece bathroom with shower. Description: A lovely cosy room on the main floor with two tub chairs and a walk in closet..
Bathroom Description: Three piece bathroom.